Tracking Supervisor: Vernon R. Wilbert Jr. Nominated for two 1997 VFX HQ Awards: Best Matte Paintings and Special Achievement Award. Digital Domain created the visual effects for the Richard Gere picture (around 33 shots), images that allowed the production to appear to have been completely shot in actual Chinese locations. In actuality, many of the landscape and Beijing city shots were comprised of 2D and 3D matte paintings based on still photographs of the Chinese city. 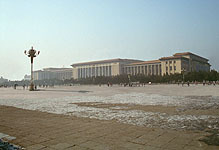 While visual effects supervisor Kevin Mack was with the RED CORNER production in Beijing, he took numerous still photographs of the actual Tiananmen Square. From those photographs, digital matte paintings were created as background plates. 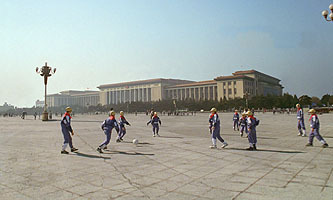 The frame on the right is a still from the bluescreen photography of a group of boys playing soccer. 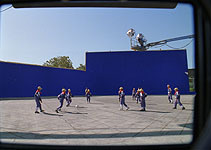 Careful attention to the geometric lines of the square's ground plane was necessary to make the bluescreen footage match the matte painting precisely. The bluescreen photography, complete with accurately matching lines in the ground, perfectly matching the angles of the original shot, was completed in a large parking lot in Playa Del Rey, California. The final image is below. Stills © 1997 Metro-Goldwyn-Mayer Inc.